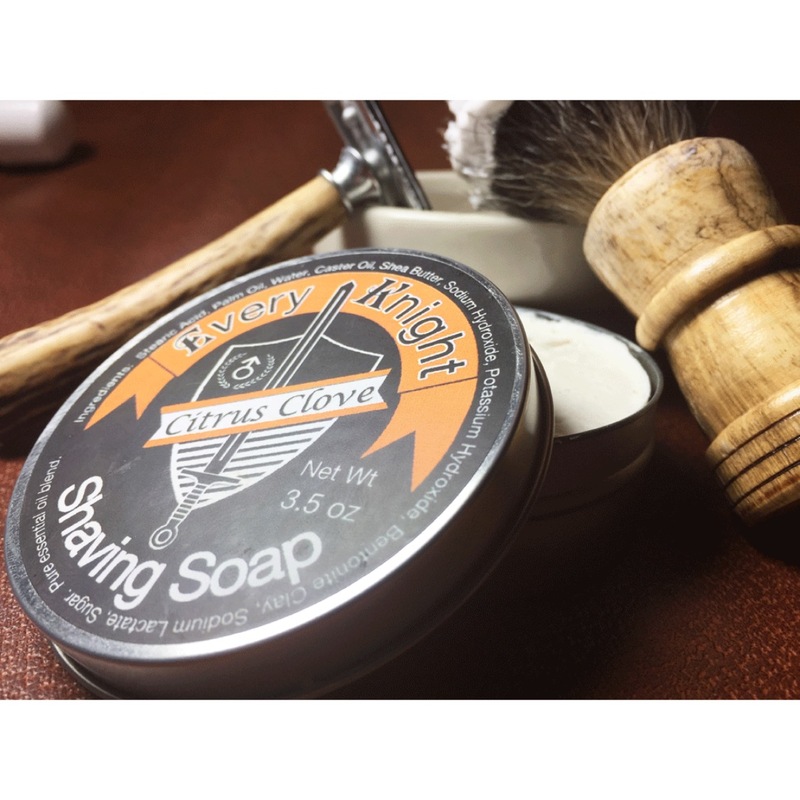 Thank you for considering our premium, handcrafted, all-natural grooming products. Our products are made from the highest quality ingredients for performance you can count on to help forge your look and style. We always handcraft in small batches, completely from scratch using all-natural oils, butters, and waxes. Our goal is to earn and keep your business. 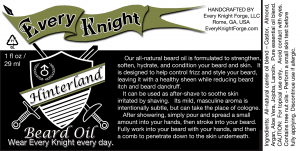 Beard Oil: Almond, Castor, Argan, Aloe Vera, Jojoba, Lanolin. Pure Essential Oil Blend for fragrance. Styling Wax: Pure Bees Wax, Shea Butter, Arrowroot Powder, Coconut, Almond, Castor. Pure Essential Oil Blend for fragrance. Hair Classic Pomade: Bees Wax, Coconut, Vegetable Glycerin, Almond, Castor. Pure Essential Oil Blend for fragrance. Stache Wax: Pure Bees Wax, Shea Butter, Arrowroot Powder, Coconut Oil. Shaving Soap: Saponified Oils of Stearic Acid, Palm, Castor, and Shea Butter. Bentonite Clay, Sodium Lactate, Sugar. 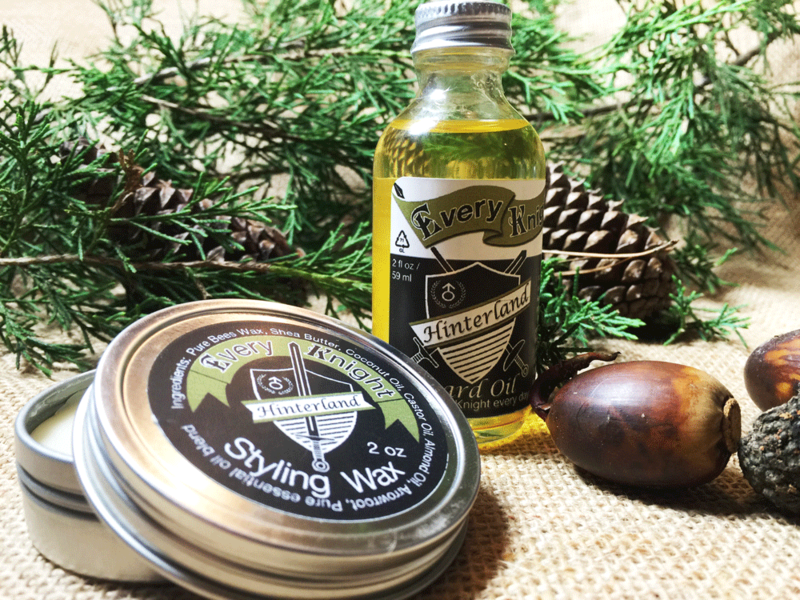 We offer three great scents and an unscented version of our beard oils, beard balms, and hair styling products. Citrus Clove is a fresh, energizing aroma. Crisp, light citrus notes of both orange and tangerine are paired with a warm note of clove. 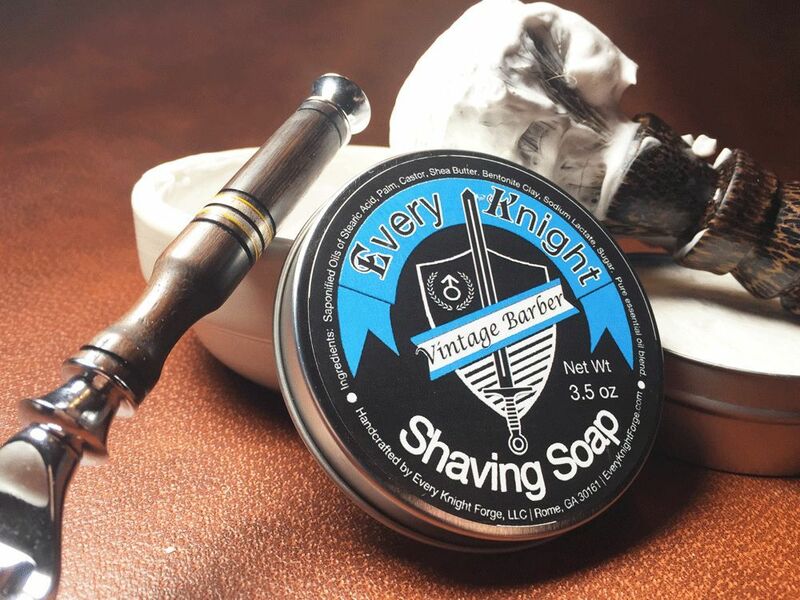 Vintage Barber is a warm, pleasing masculine scent with distinctive spicy-floral notes of bergamot and soft, aromatic West Indian bay leaf top notes. Hinterland is our backcountry champion. Woodsy and earthy base notes of Virginia Cedarwood and patchouli are paired with sweet notes of vanilla. Unscented has no fragrance added. 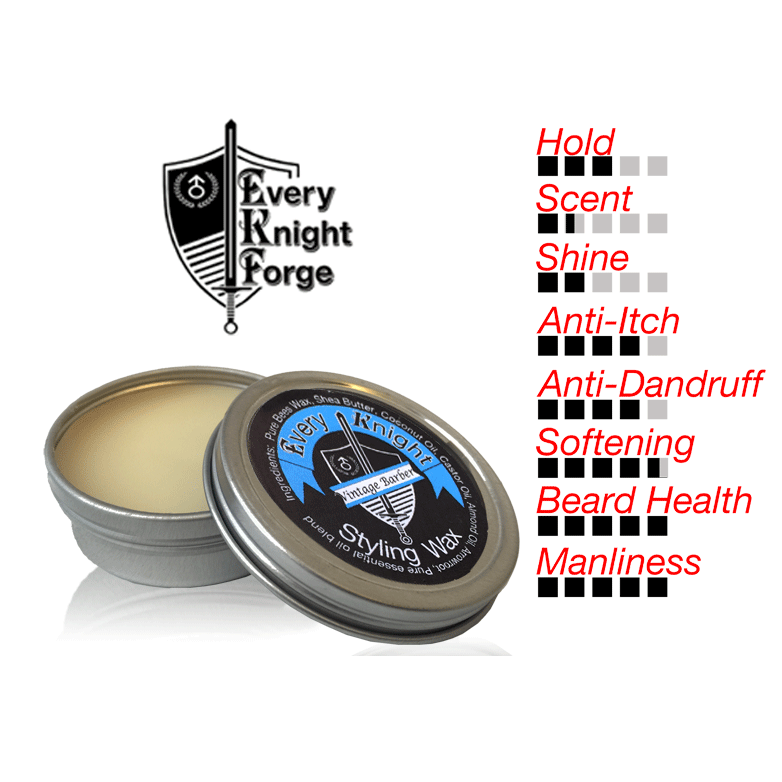 The only scent is that of the very mild, all-natural carrier oil blend, so its smell will not compete with your favorite cologne or after-shave. 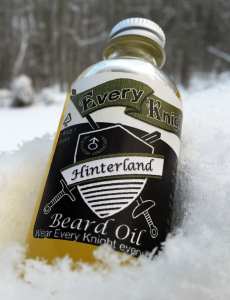 Our all-natural beard oils and beard balms are formulated to strengthen, soften, hydrate, and condition your beard and skin. They are designed to help control frizz and style your beard, leaving it with a healthy sheen while reducing beard itch and dandruff. They can be used as after-shave to soothe skin irritated by shaving. Their mild, masculine aromas are intentionally subtle, but can take the place of cologne. 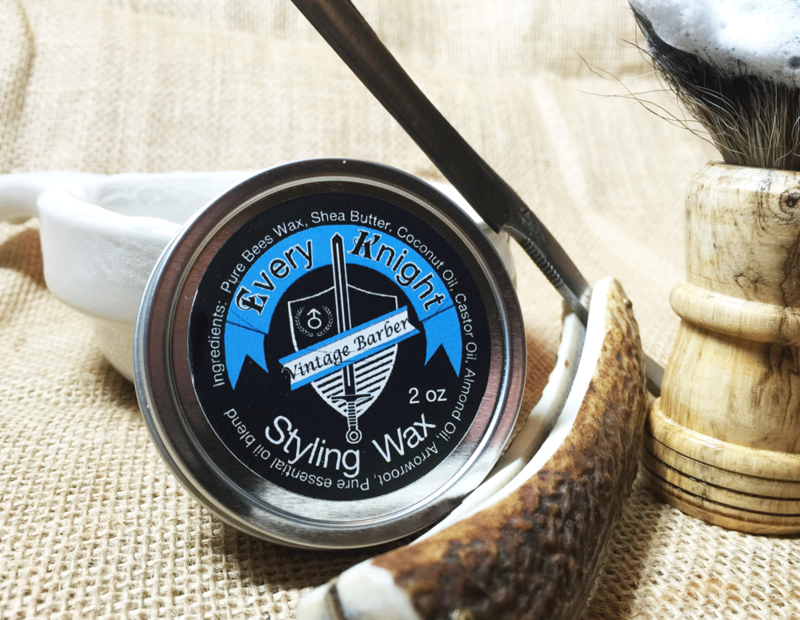 Mold and sculpt your hair with our all-natural Every Knight hair products and give your hair a finished look with superior hold and style. Our products are great for taming your fly-aways and controlling the friz, helping you look your very best. If you’re looking for hold, our wax is the way to go. Our all-natural hair styling wax is formulated to strengthen, sculpt, and condition your hair and beard, while giving a medium/strong hold. 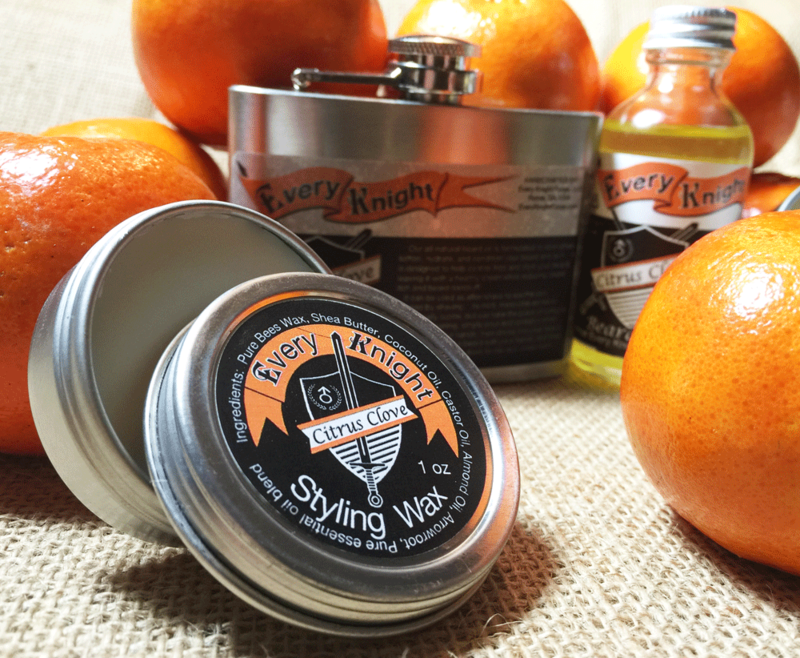 If you have oily hair, our wax is probably the better choice over pomade. Hair Types: Thicker and medium hair lengths. Beard Types: Medium and long beard lengths. Tip: Can be used on wet or dry hair/beard but is easier on slightly damp hair. Simply load an entire thumbnail with wax by gently scraping the surface of the wax with the back of your nail. Warm up by rubbing in the palm of your hands. Then, distribute evenly in your hair to achieve desired result. 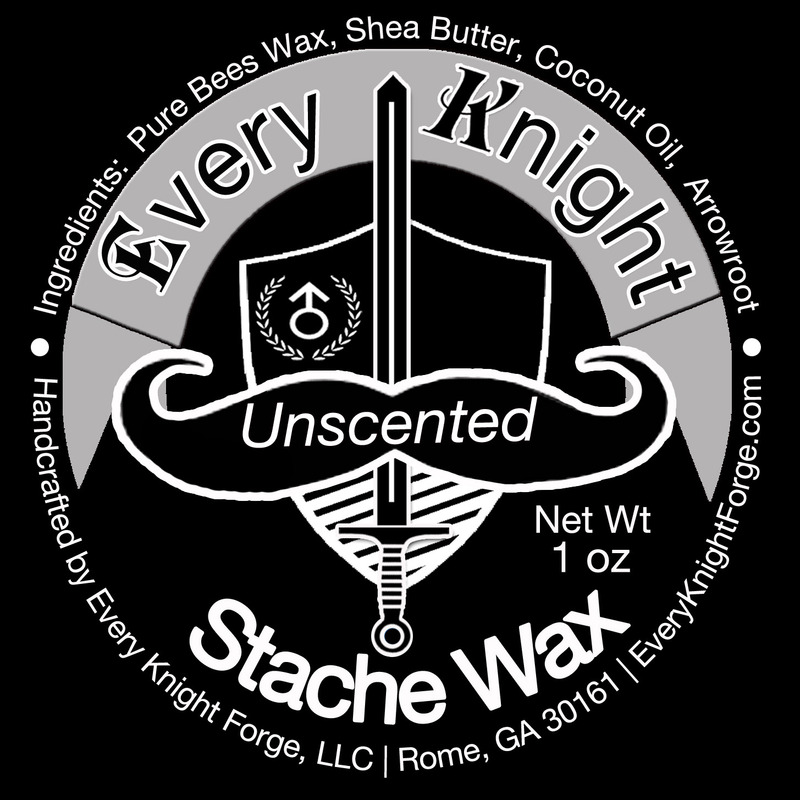 If you’re looking for a chemical free hold, our Unscented Stache Wax is the way to go. Our all-natural stache wax is formulated to strengthen, sculpt, and condition your mustache, while giving a medium-strong hold. pea size ball. Flatten the ball and warm up by rubbing between your fingers until the wax is workable. 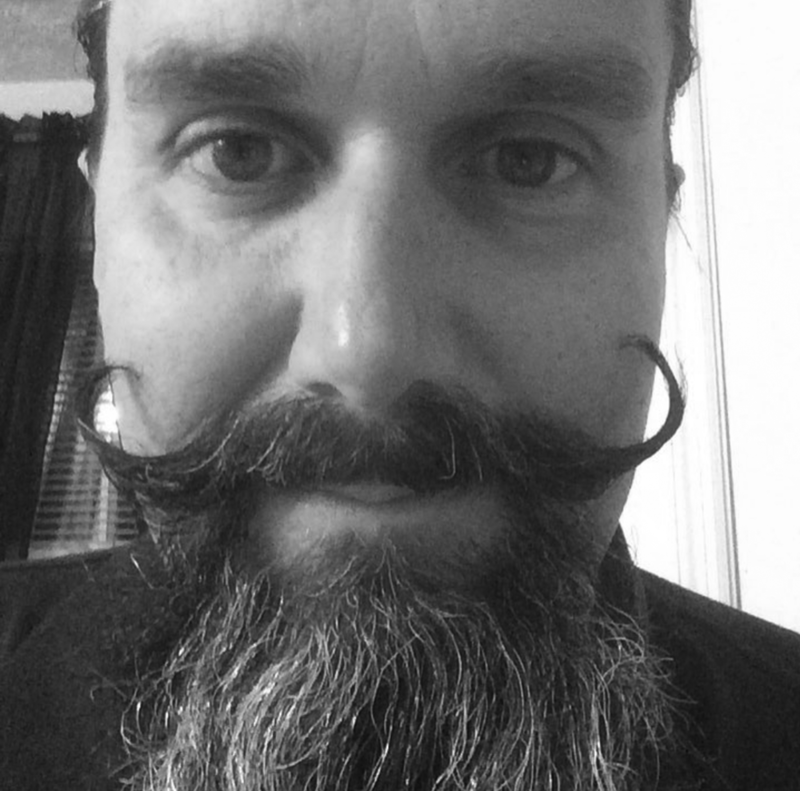 Distribute evenly into your mustache, starting in the center and work towards the tips. Fully work the wax into your mustache with a fine-tooth comb, then mold and shape to achieve desired result. After showering, simply pour and spread a dime-sized amount into your hands, then stroke into your beard. Fully work into your beard with your hands, and then a comb to penetrate down to the skin underneath. After showering, load an entire thumbnail with balm by ge ntly scraping the surface of the balm, then, spread that into your hands, and stroke into your beard. Be sure to fully work into your beard, first with your hands, and then a comb to penetrate down to the skin underneath. Simply load your thumbnail with a small amount of stache wax by gently scraping the surface of the wax with the back of your thumbnail. With your thumb and forefinger, work the wax into a pea size ball. Flatten the ball and warm up by rubbing between your fingers until the wax is workable. Distribute evenly into your mustache, starting in the center and work towards the tips. Fully work the wax into your mustache with a fine-tooth comb, then mold and shape to achieve desired result. There are many techniques for whipping up a perfect lather. We encourage you to experiment and find the method that works best for you. 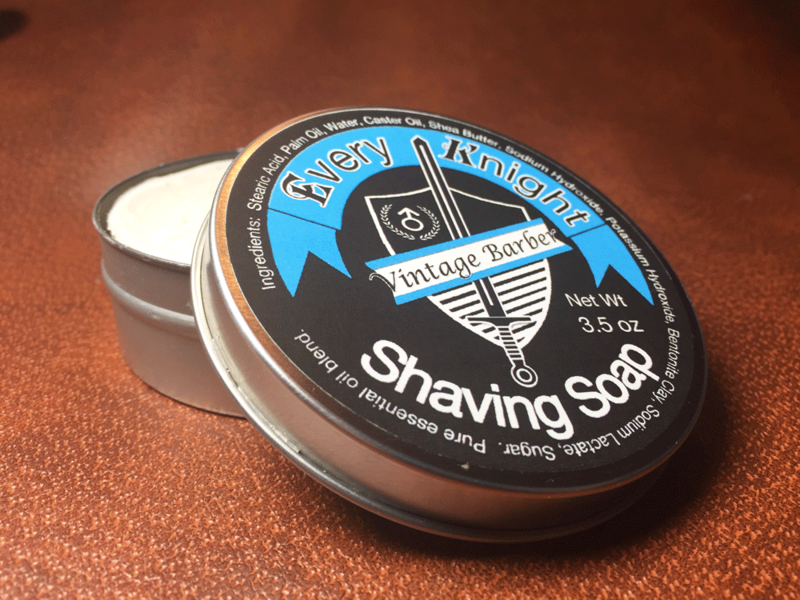 The real trick is to find the right combination of soap and water, and then creating a lather with your shaving brush to achieve your desired consistence. Start by soaking the bristles of your shaving brush with hot water. Work the brush and soap in a circular pattern as well as back-and-forth for several seconds. A lather will form almost immediately. For a thicker, richer lather, continue to work the soap with your brush. Note: you may need to add (or remove) a small amount of water during the process. A lather ranging from very thin to a yogurt consistence can be achieved with a small amount of time and effort. Caution: Our grooming products contain tree nut oils – Perform a small skin test before fully applying. Discontinue use if allergic. For topical use only – DO NOT consume. Avoid contact with eyes – Wash hands after applying.